The St. Martin’s Guild Band: Back Row (L-R) Julia Cater, Richard Jones, Paul Bibilo, John Anderson John McDonald. 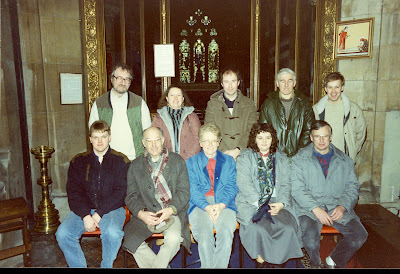 Front Row (L-R) Mark Gilthorpe, David Hull, David Pipe, Maurice Edwards, Mary Rees. The 12th annual W. W. Worthington Trophy Ten-Bell Striking Competition was held at Burton on 18th March. 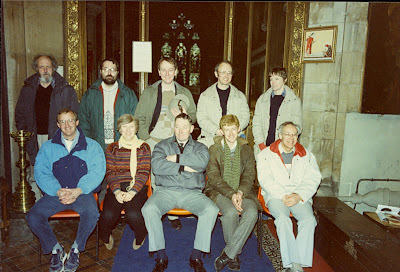 A wet and windy day which forced the photographer to move inside and the competitors to seek shelter at the back of the church to enjoy the refreshments served by the ladies of St. Paul’s nor to head out of Burton to ring at the three towers available for general ringing during the afternoon. The official proceedings began with the Vicar of Burton, the Reverend Morris, welcoming those present to St. Paul’s for what has become an annual established event in the bell ringing calendar. This year seven teams had entered the competition, two fewer than last year, but only six names going into the draw with the late withdrawal of North Staffordshire Association team. The vicar announced the date of next year’s competition, 7th April, and the master of ceremonies for the day asked if the captain of the Derby team could see him regarding payment of the entry fee before climbing the tower! 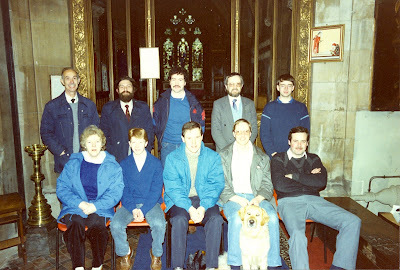 Ringing was soon under way, the test piece a plain course of Cambridge Surprise Royal causing no major problems to any of the teams during the afternoon, with the Derby Diocesan Association team starting off by drawing first place and the home side concluding ringing having drawn last place. General ringing in the afternoon was enjoyed by many, at Newchurch (5), where even the more experienced learned quickly how to slip wheel, Abbott’s Bromley (8), where the excellent “go” of the bells makes them a pleasure to ring, and Rangemore (5) on the Derbyshire border; before returning to Burton for the results of the competition via an upturned Marmite lorry which had shed its load near the station. Our judge for the day was Paul Flavell, ably assisted by his wife Kate, and it wasn’t long after the first band had descended the tower that Paul began the adjudication by prefacing his remarks explaining his marking system and commenting upon the different speeds of ringing during the afternoon. Teams have been credited with a maximum of two points for every “clean” change rung, one point for a clipped change and so on, Paul expressed his gratitude for being asked to adjudicate and then proceeded to give the results: 1st – St. Martin’s Guild (296), 2nd­ – Derby Diocesan Association (274½), 3rd­ – Midland Counties Guild (271), 4th – Worcestershire and Districts Association (261½), 5th­ – Leicester Diocesan Guild (254½), 6th -­ Shropshire Association (197). John McDonald received the trophy on behalf of the winning team who duly made their way to the “Star and Garter” and filled the cup with several pints of the best for all to share. M.Q. 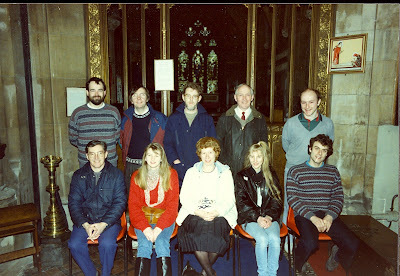 David J Marshall, Jane E Orchard, Patricia A M Halls, Gordon A Halls, Simon J Poole, C Frederick C Pearson, Margaret A Wright, F Gordon Faulks, John V Chadwick, Steven Peers. 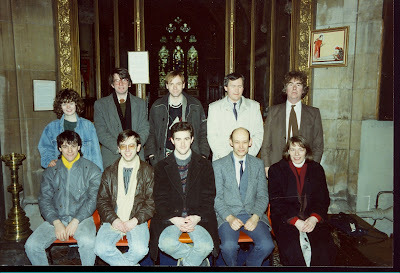 Andrew D Evans, Stuart D Piper, Simon J T Wilmshurst, Gareth R Brock, Louise M Slater, David Beacham, David G Franklin, Charles S Hayward, Roy K Williams, David P Bagley. 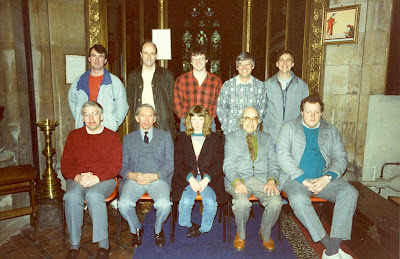 Brian S B Kear, Paul Lewis, Ernest F Willcox, Gillian R Glover, R F Philip Cleaver, Colin Walker, Alan M Glover, John D Neal, David K Gough, Wendy Gough. ell, ably assisted by his wife Kate, and it wasn’t long after the first band had descended the tower that Paul began the adjudication by prefacing his remarks explaining his marking system and commenting upon the different speeds of ringing during the afternoon. Teams have been credited with a maximum of two points for every “clean” change rung, one point for a clipped change and so on, Paul expressed his gratitude for being asked to adjudicate and then proceeded to give the results: 1st – St. Martin’s Guild (296), 2nd­ – Derby Diocesan Association (274½), 3rd­ – Midland Counties Guild (271), 4th – Worcestershire and Districts Association (261½), 5th­ – Leicester Diocesan Guild (254½), 6th -­ Shropshire Association (197). John McDonald received the trophy on behalf of the winning team who duly made their way to the “Star and Garter” and filled the cup with several pints of the best for all to share. M.Q.